Hardback. Scarce 1st edn. 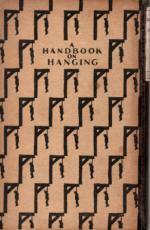 'Being a short Introduction to the fine Art of Execution, containing much useful Information on Neck-breaking, Throttling, Strangling, Asphyxiation, Decapitation and Electrocution; Data and Wrinkles on Hangmanship; with the late Mr. Hangman Berry's Method and his pioneering List of Drops; to which is added an Account of the Great Nuremberg Hangings; a Ready Reckoner for Hangmen; and many other items of interest including the Anatomy of Murder. Finally Definitive Edition Diligently Compared and Revised in Accordance with the most Recent Developments in the Art. All very Proper to be read and kept in every Family'. With Appendix. 128pp. 12mo. h/back. 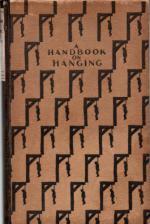 Covers have a repeat motif in Art Deco style of a silhouette of somebody dangling from a gallows. Lightly browned edges and eps, tiny name insc. to ffep o/w a Vg+ copy of a scarce 1st edn.